Sewing was my first love and my first baby steps toward authenticity as I chose fabrics and tailored my own clothing. Sewing opened the doors to building my business making custom canvas for boats. That was thirty six years ago. Each step along the way has been empowering, from renting my first storefront in downtown Ballard and hiring my first employee, to walking the docks gathering ideas and information. 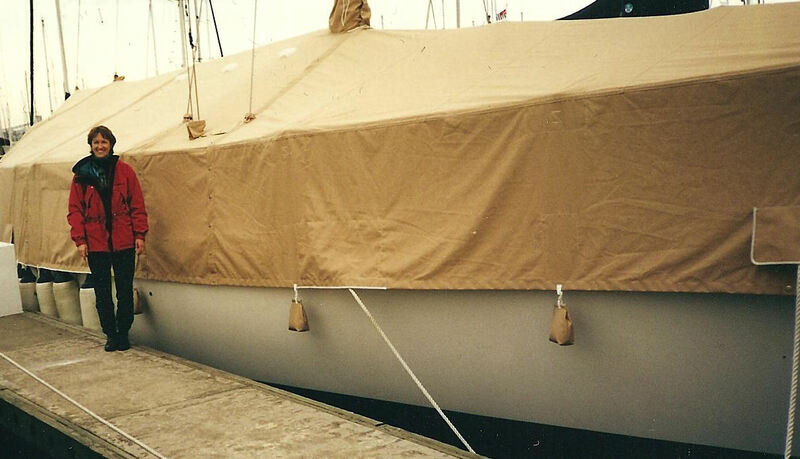 How was that sailcover created from two dimensional measurements? Which direction do the seams run on that boat cover? How did they get that dodger so smooth?? Without giving it a name, I developed a methodology of patterning, cutting and taping around various boat parts like wrapping a present. I became bold about tackling new projects and, as my staff grew, busy measuring, ordering materials, planning. There were so many firsts. My first bookkeeping efforts with a “Dome” accounting notebook, then later, careful entries into a twelve column ledger. I fired my first employee (painful, humbling). I began asking for 50% deposits before beginning work. I remember clearly the first customer I asked (all boldness!) for a $100 deposit and my wild eyes when he opened his wallet and handed me a 100 dollar bill. I hardly knew what to say. Repeat business and word of mouth grew my company and me at a rapid pace. It was my lifeline, my best friend, my child. I wore hats I had never imagined: sales person, manager, minister (employee woes!). I led meetings, made and met forecasts and made plenty of mistakes with many people watching. I never dreamed my sewing would become so large, so sculptural. So lucrative. And yet, now, I am preparing to say goodbye to this long term relationship, the longest I have ever had. Memories crawl out of corners and surprise me like those spiders who weave webs overnight. I try to move through them slowly so as to catch the morning light lingering in their dew drops. Some days, sadness and tears erupt to random tunes on the radio. Today, it was “Angel” by Sarah McLachlan. I didn’t realize until last night: I am grieving. Our memories shape us as surely as a chisel carves a figurehead. So, also, does time wear away the edges and soften them. Grief carries the gift of remembrance. And the gift of gratitude. I have been held so dearly by this work of mine. The time has come to part. Such heartfelt prose. Thank you for sharing your inner thoughts and feelings. Thanks Carol. Writing is such a wonderful way to process! 36 years…. since before I was born! I have many lovely memories of your ballard shop… that front bay window that you always had treasures in for me to explore… the smell of the canvas, the thump of those huge bolts of fabric, the whir of the machines, the smell of the heat knife, the THWACK of the grommet setters….. Thanks for sharing your memories, Jessica. I’m looking forward to our road trip to Montana… plenty of time for thinking and talking with wonderful you and family at the end! If I recall correctly, the literal meaning of the Greek word ‘nostalgia’, is something like ‘memory sickness’. These days, it mostly has more positive connotations, but we can still certainly have mixed emotions as we ponder our past. Thankfully, my nostalgia is mostly sweet, which is why the great sadness in ending. Still, there is excitement for the new, whatever it is. Just beautiful. My wise mother in law used to tell me “When God closes a door, he opens a window”. I wondcurtains the curtains will look like on your new window? Thanks Denise. I like your visual… and I’m seeing curtains waving in the breeze… a welcome and inspiring sign! I’m having a tough time myself deciding what to let go of and what to truly pursue. I’m anxious to hear your story of sorting it out someday in hopes that it will help guide me. I have way too many things going on in my head these days!